4 bedroom, 3 bathroom villa in the The Manor at Westhaven community. Owned by Stephen Burns. Ref: 1423. Only 15 minutes from Disneys main gates, the villa is in a peaceful location to unwind after those fun packed long days in the theme parks! Hi guys, our names are Stephen & Diane Burns and we have been visiting Florida since the late 90s. We are both from the North East of UK, 8 miles east of Newcastle Upon Tyne and a short walk from the sea side. We love travelling and eventually bought "Time Share" from a company my brother worked for and travelled all over the world but more often than enough we would keep coming back to Florida staying in some wonderful timeshare apartments. After doing several months of research into having a home build in Florida, we took the plunge in 2005 and havent looked back. 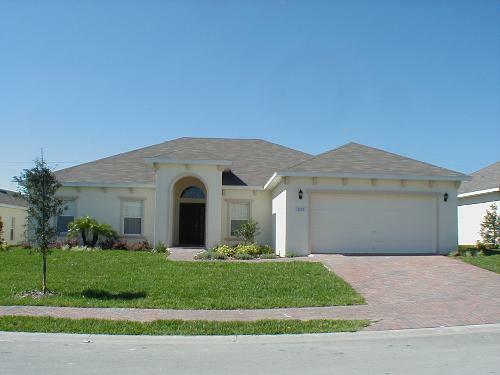 I remember travelling over on several occasions to see the build and in September 2005 we opened the door to our dream home, our little bit of Florida. I have lost count how many times we have been since 2005, but we just loved to share our home with other people who wish to rent it from us as it is so much better than being in a hotel room. So, to those of you who have taken the time to read this small Bio of us and you like what you see, then what you waiting for, book our wonderful home for that special holiday. For privacy reasons, the marker on the map shows the The Manor at Westhaven community location and not actual villa location. 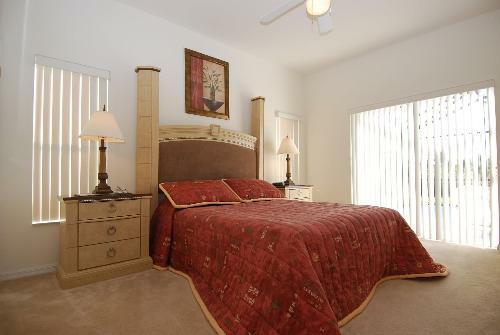 Our fully air-conditioned villa offers all the benefits of Floridian living. Several Palm Trees are situated around our home. One of the two master bedrooms has been made wheelchair accessible with wider doors and a roll-in shower for our guests with disabilities. The second master has its own en-suite and the two twin bedrooms share a third bathroom which, also acts as a pool bathroom. 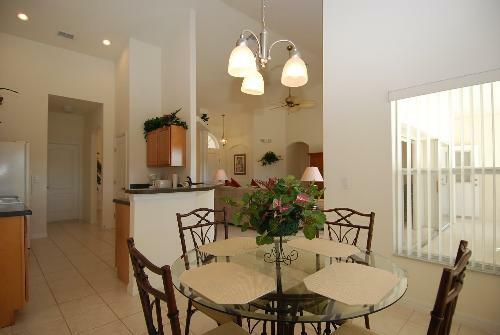 A fully fitted kitchen, extended lanai with beautiful poolside furniture around the screened pool & spa. 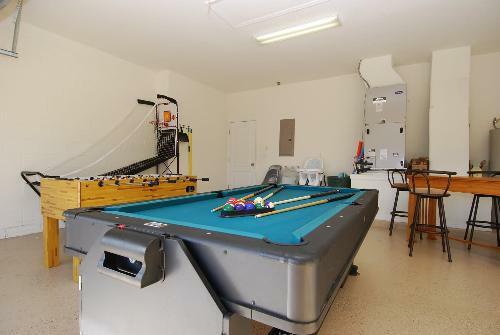 Also on this prestigious gated community are a tennis court and a childrens playground with a cabana. 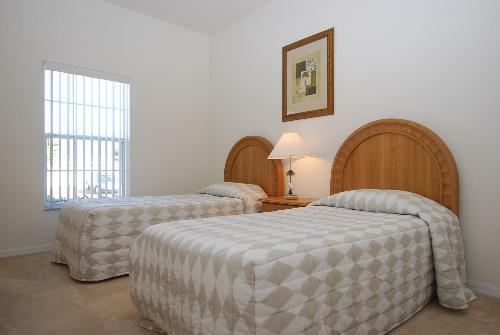 The property is connected to the Brighthouse network for all your communication needs, free telephone service throughout the USA, Up to 7 Mbps of Internet Download Speed with WI-FI access and 200+ TV Channels. Why book into a hotel when you can rent this villa at a competitive price. Has a King size bed. A 32" LCD flat screen TV, which is connected to cable TV. There is a large walk-in closet for your clothes. Fabulous veiws and access to the pool/lanai from both master bedrooms. Leading on into the master bathroom, here you will find an extra large walk in shower, w/c and twin vanity sinks made of marble with wall mounted Hollywood lighting. Each of the three bathrooms has a hair dryer for your convenience. Has a Queen size bed. A 24inch flat screen TV, which is connected to Cable TV. Another closet can be found in here to hang all your clothes. There is also fabulous views and access to the pool/lanai from this bedroom. Second master bedroom has its own en-suite bathroom. A large walk-in shower, w/c and twin vanity sinks made of marble with wall mounted Hollywood lighting. Third and Fourth bedrooms are twins which, share a bathroom. 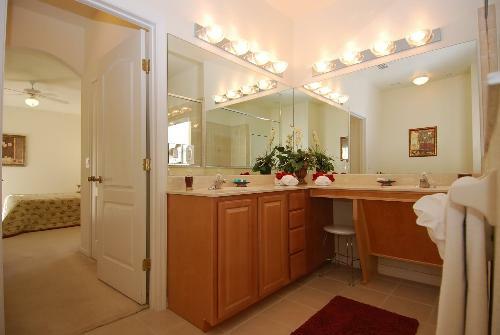 Here you will find a vanity sink, w/c, shower and tub. One of the Twin bedrooms also has a Portable TV, which is connected to Cable TV. Walk-in closets are also available in both twin rooms. The Family room hosts a 32" Cable Flat screen TV, Blue ray DVD. There is also a PS2 games console with dual controls. There is a huge soft leather sofa to accommodate all guests. There is a large formal dining table for those special occasions. The ceiling is vaulted to maintain cool temperatures. We have 12ft sliding doors, which allows direct access to the pool/lanai area for outdoor Floridian living. The kitchen is fully equipped with a built in microwave, Cooker/Oven, side by side refrigerator/freezer with ice and water dispenser and all the utensils you need, including the cork screw! To the side, we have a nook with a breakfast table and four chairs. For your convenience there is a Washing machine and Dryer in a separate room. To the rear of the villa, the large private screened swimming pool 30ft x 15ft incorporating a 7ft Jacuzzi/Spa is also at your disposal. The pool & spa can be heated. The huge Lanai/pool deck with poolside furniture i.e. 6 Sun Loungers and a large table with 8 chairs are perfect for those relaxing days by the pool to catch that perfect tan! A Child security safety net is installed around the pool should you have children. For the comfort of other guests, the villa has a strict No Smoking Policy & No Pets are allowed in the Villa. 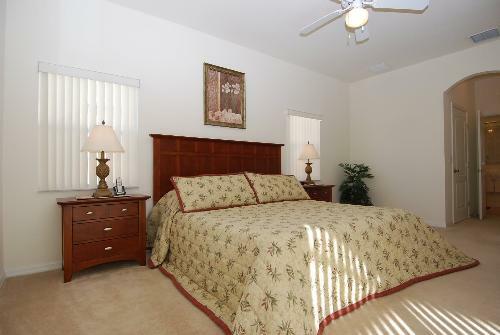 Ceiling fans in all bedrooms/living area and Lanai for extra comfort. Free use Four tennis rackets. Free use A Stroller (Pushchair). Free use A High Chair. 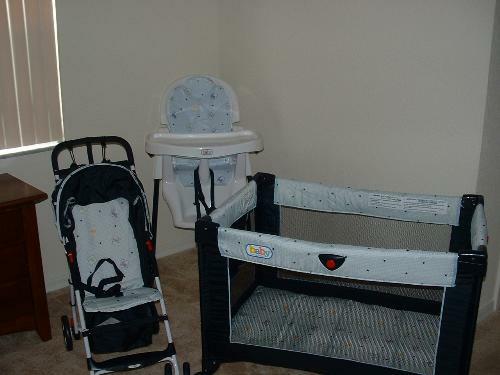 Free use A Travel cot. Smoke Alarm & Emergency Lighting. Childrens safety net around the Swimming Pool. Supermarket, Pharmacy, Mcdonalds & a Chinese & Pizza takeaway within a 4 minute drive. Omni Hotel with several restaurants. Low season prices from $850.00 / £650.00 per week. Peak season prices from $1200.00 / £955.00 per week. The price of the Villa is per week, NOT per person. This equates to £110 per person, if 8 stay in the Villa. It is advisable to use this during the months Oct - March. Stays of less than 7 days will incur a cleaning charge. A reservation deposit of £150 / $250 per week booked is payable at the time of booking and is non-refundable. THE FULL BALANCE IS PAYABLE NO LATER THAN 10 WEEKS PRIOR TO DEPARTURE. A SECURITY DESPOSIT OF £200 OR $300 IS TAKEN BY US AND IS PAYABLE AT TIME OF FINAL BALANCE PAYMENT BEFORE ARRIVAL. THIS IS REFUNDABLE PENDING A FINAL INSPECTION OF OUR HOME. Returning to the UK was awful! Especially after spending so long at your fabulous villa! Everything was absolutely perfect. The community was lovely - so peaceful and one the best maintained we have stayed on. The fact that it was gated and that the gates were closed just added extra peace of mind for my wife regarding the children. We have stayed on other gated communities where the gates where always open! The positioning of the villa was perfect for us. Everything we needed was local and it was only a short drive to Disney. The villa itself is absolutely gorgeous. We had everything we needed and enjoyed living in luxury in the sun! The pool is one of the most important parts for us and yours is fantastic. Perfect temperature and a nice size. We particularly enjoyed the large lanai area - we have never stayed in a villa with one so large. Overall a perfect stay. We are gutted that our holidays from work in June do not match the available dates in your villa. We would have jumped at the chance to stay there again. We will definitely be looking at your villa for our summer 2012 holiday! Average rating: 5.0 / 5 from 23 reviews. Nice villa on a secure community, close to restaurants and shops at Champions Gate. Well equipped, kitchen,lovely large outdoor area with plenty of sun beds and chairs, with lots of shade from the Florida sun. Large swimming pool and hot tub, heated to the correct temperature. Not overlooked at the rear, with a wood being directly behind. Enjoyed our stay for the month. Owner's response: Many thanks Cyril and Christine for the review and pleased you enjoyed your month long stay with us. Owner's response: Tommy, thank you for writing this review and we always try our best to give the best possible advice to all our guest's and we hope to see you again. We had a lovely time staying at this villa, owner was very honest and helpful both before and after our holiday. Owner's response: We always make ourselves available and try to help as much as possible. We’ve just enjoyed 2 blissful weeks staying at this beautiful villa. 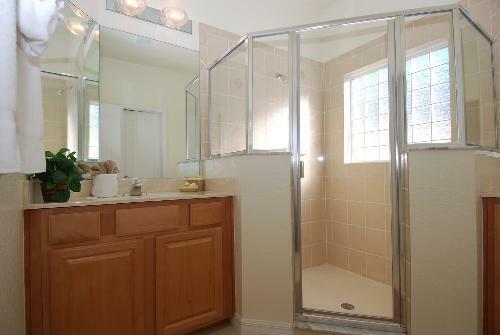 Situated in a gated community on leafy lane, it is very near to the I-4 and all the Disney attractions. This villa is spacious, quiet, comfortable, clean and very well equipped with a beautiful pool and lanai that isn’t overlooked at all; a wonderful place to relax after a day out in the Florida sun. It can accommodate 8 adults and has a fabulous games room, a couple of children’s buggies and a high chair too. The master bedroom has a very large shower/wet room in the en suite which is equipped with facilities to support anyone needing to use a wheelchair; there is nothing this villa doesn’t have! The villa’s owner Stephen made renting this place very easy guiding us through the process with texts, phone calls and emails which we very much appreciated. I would thoroughly recommend this villa to anyone wanting to visit Florida and wouldn’t hesitate to go again. Thank you, we had a fabulous holiday. Owner's response: Paula it was our pleasure to have your stay with us and to receive such lovely comments is rewarding for us as we put a lot of hard work into keeping our home looking great. Look forward to having you return in the future. A beautiful villa in a fabulous location! The villa is well equipped with great facilities; a fantastic pool area, spacious living areas and lovely bedrooms. Even the garage has a fantastic selection of games and entertainment suitable for all ages. The villa was clean and well managed and it was a pleasure staying there. 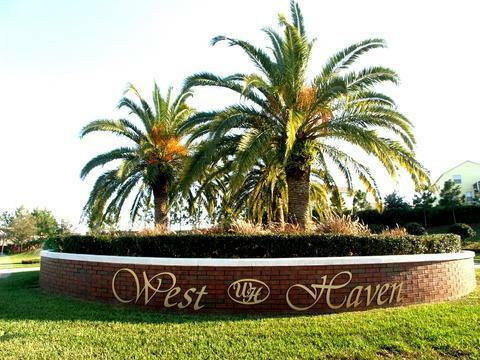 West Haven is very close to all the attractions and is so accessible. Would definitely stay here again! We’ve stayed in the area before and this villa certainly didn’t disappoint. My children especially loved the heated pool which we haven’t had before in previous villas so was a lovely addition. Owner's response: Paul it was a pleasure having you and your family stay in the villa and I have no doubt you will return and stay with us. Also we had the luck to see Elon Musk – SpaceX lifting off from Kennedy Space centre – crazy …..
2 weeks away from the dark cold Scandinavian wither is a good investment! Owner's response: Hi Niels, Di & I look forward to you returning to Florida and staying with us for a second time and thank you also for taking the time to give us a review. Stayed two weeks in this villa and could not have been more satisfied with the property or the location. The pool is excellent and faces onto a woodland which means it is really private and not overlooked. Everything you could need is supplied (even to have a couple of child car booster seats and pushchairs in the garage which also contains several games equipment such as table tennis, air hockey, pool table and dartboard) It was our third visit to Orlando and I have no hesitation in recommending this villa to anyone considering renting in Orlando as it is the best one we have rented. 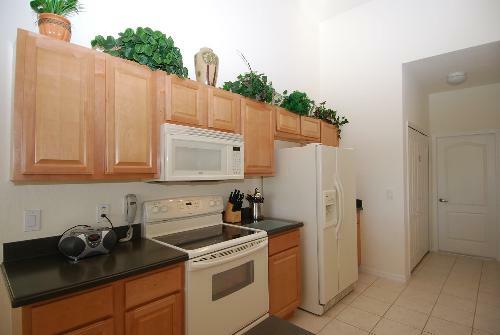 It is only about 15 mins drive to the Disney Parks etc with easy access to the I4 highway. I would also like to say it has been a pleasure dealing with Diane and Stephen who made it so easy to book and were very accommodating with any queries we had. If we return again I would certainly contact them first to see if the villa is available. Owner's response: Dear Peter and family, it was our pleasure to have you stay in our villa and should you return to Florida we wouldn't hesitate in having you stay with us again. We have just returned from a lovely stay in this great villa. We have been to Florida several times before , but this is the best villa we have stayed in. 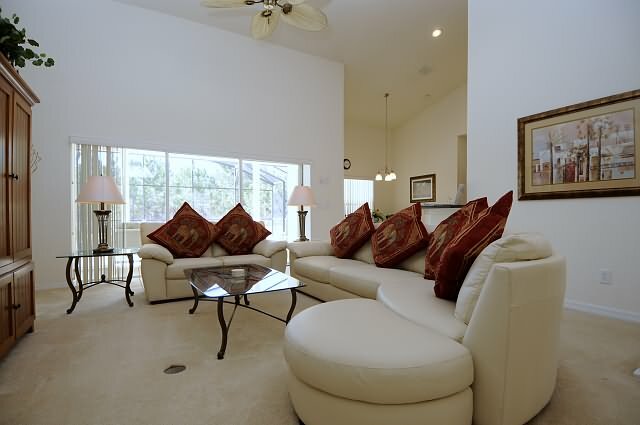 It is so spacious with a very large lanai and pool area. We were four adults and had plenty of space to feel comfortable in. We spent a lot of time by the pool and it is not overlooked , with a forest to the rear . The villa is situated in a very nice gated community and is very well situated for visiting the parks plus being close to restaurants and shops. We would love to stay here again when we return to Orlando, hopefully in the not too distant future. Thank you for giving us the opportunity to stay in your lovely villa. Owner's response: Hi Jane, many thanks for taking the time to put a review together and we are so pleased you all enjoyed your stay with us and we look forward to having you stay with us again. 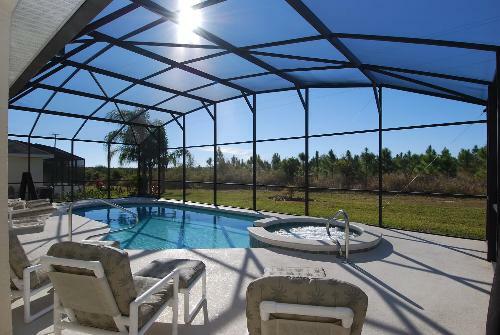 This villa is ideally situated for visiting all parks, Disney and Universal and the coast. Five of us stayed here and we all had plenty of room. The location is ideal for peace and relaxation, needed between visits to the busy parks. The villa had everthing and more, needed for a perfect holiday. The pool and lanai back onto a lovely wooded area lovely sitting out and winding down at the end of a busy day. Will definitely stay again. Owner's response: Many thanks for your review and we look forward to having you stay with again. We have stayed in this wonderful villa many times. It is always spotlessly clean and well maintained. The location is fantastic in a quiet gated community a short drive from the local amenities at Championsgate and within easy reach of all the parks. Both the owner, Stephen, and his local management company are a pleasure to deal with. We were there during Hurricane Irma and the management company contacted us a number of times to make sure we were ok and had everything we needed. My wife is a wheelchair user and the villa is ideal for her, being all on one level and having a large wet room shower in the main master suite. The property is beautifully furnished and the pool area is fantastic with a very large pool and hot tub which is not overlooked. We can't wait to return again. We had the "Best Time Ever". This is the second time we have stayed at Mr. Burns villa. It is like a home from home. Comfortable furnishings, well equipped kitchen, laundry room, wet room, family bath room and en- suite, 4 large bedrooms, beautiful pool and jacuzzi, very nice to use after a hot busy day at the parks. No need to pack towels, Mr. Burns provides pristine white bath, hand, towels together with face cloths, although you might like to take your own towels for the water parks and beach. The villa is essentially very clean and well maintained, In a very good location for your day to day needs and essentially the Disney Parks. We would certainly use Mr. Burns villa again and would fully recommend it. The villa was home from home and beautifully furnished.Every facility was catered for and in a very convenient location for all the Disney Parks. The pool and spa were great and plenty of outside space with ample seating/dining areas. I would happily rent this villa again. Owner's response: Hi Pat & family, many thanks for the feedback and we do love the outside space around the pool also and there is plenty of it. Look forward to having you return to us in the future. What a beautiful villa, in a fantastic location. Gated community that is so well kept. Villa itself was perfect for what we needed, following either a long day in the parks or just a lazy day by the pool. The owner, Stephen, couldn't have been more helpful from time of booking to our return. Would definitely recommend. Owner's response: Amanda, thank you for taking the time to put a review together and we are so pleased you enjoyed your stay with us. The villa was in a perfect location for our week in Orlando in which we mainly visited the Disney Parks. The villa is located in a smart, quiet, residential gated development within 15-25 minutes of all the parks, just off a main road and easily accessible to supermarkets and several restaurants. The villa itself was spacious, spotless and well equipped with all we needed for a very comfortable stay. The pool and hot tub were very welcome after a day at the parks.and the games room was used by my teenager son most days! The master suite's ensuite bathroom was perfect for our specific needs - we have a disabled son who uses a special toilet and shower chair. The shower was level access and very spacious which allowed us to take care of our son very easily making our stay as comfortable as it could possibly have been, thank you! We would not hesitate to recommend the villa to anyone and we would certainly book again if we were wanting to stay in Orlando. Owner's response: Hi Jo, it was a delight to have you stay in our villa and would welcome you back again in the future. a wonderful home really spacious and everything you need there, also very close to all the parks would definitely recommend. we had a wonderful time. Owner's response: Lorraine, thank you for taking the time to write this review and for also recommending our home to your friends. I would thoroughly recommend this villa to everyone - the most peaceful we have ever stayed in. The extended lanai was perfect for us shade lovers, the pool area as a whole is outstanding and very private. 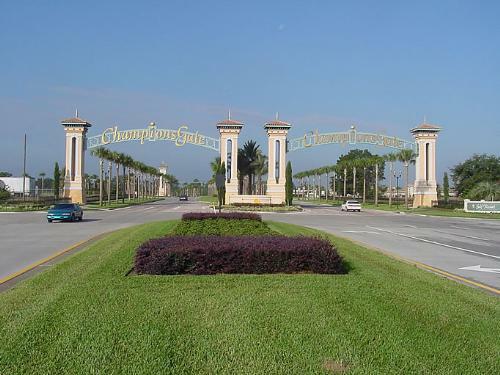 Championsgate is a great location within easy access of all the parks. We had a wonderfully relaxing stay here and would love to stay again. The villa was perfect for the 6 of us, it was well laid out, big bedrooms, everything you needed was in the kitchen and a great pool. 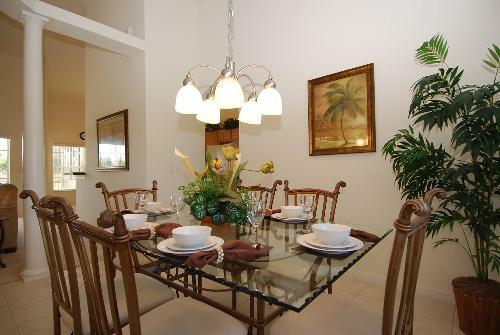 The villa is well situated for the theme parks, restaurants, and food shopping. We have stayed in other villas before but Stephen was a really helpful with advise etc, was always on the end of emails or the phone, rang us while we was away just to make sure everything was OK. I would recommend this villa. Owner's response: Paul, many thanks for the review and we are so pleased you enjoyed the villa and all the facilities in it and the support we give to guest's, before during and after departure. My family and myself had a wonderful time in Florida ! Much of the stress of booking a villa was taken away with the help of owner Stephen who made everything so easy for us !! From start to finish was always helping with extras like tickets for parks and car hire !! The villa itself is wonderful. Really good size with the two main bedrooms being massive with cracking big bathrooms !! The big thing for our family was the pool area . Great size pool and spa but massive deck area for when at villa, spend all our time outside in sunshine or shaded area !! My three kids ( 13-11-4) had a great time playing in the pool and also the games room in garage !! Wouldn't hesitate in coming back and recommending this villa to family and friends !! Owner's response: Hi Jason, Karen & kids.... It was so good to have you stay in our villa and you found the help and advice we gave you useful. We know you will be back with us sometime in the next few years and thank you for being the perfect guest's..
A wonderful villa. 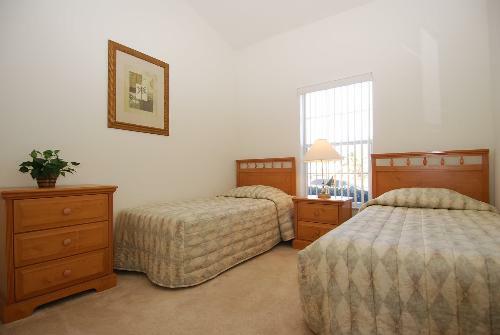 Superb location close to championsgate and it's facilities and the I4/192/27 main roads. The villa has an extended lanai with big pool and built in hot tub, and is south facing. Many an evening was spent sitting out there enjoying the last of the sun in total privacy as it faces a conservation area of trees. With plenty of space, fully equipped kitchen, WiFi, games room and cable TV you really can't ask for more. I can't wait to return in 2018. Owner's response: Hi Carol, thank you for the review and we always aim to make the holiday for all our guest's the best possible experience they have had. We look forward to having your stay with us again. It was immaculate on arrival and everything we needed was provided even British plug converters which we had forgotten. The service we received has been excellent start to finish. We really appreciated your help and advice whilst booking and during our stay anything we asked for help with was dealt with promptly by Alan, even when storms damaged the netting over the Easter weekend, by the Monday it was replaced. The community is quiet and extremely well kept and the villa had a private outlook where we enjoyed some very pretty wildlife in the mornings. We felt safe and enjoyed the luxury. The kids loved the garage with the games in. It was definately the right choice for us and we won't hesitate to book again if we visit Orlando again. Thank you again for allowing us to use your lovely home. Enjoy your holiday!!! .... Now we are all back at school!!!!! I stayed in Mr Burns' beautiful villa for 2 weeks in May 2016, having found it online in a Google search. It is very spacious, and has everything you need to make your stay comfortable. The street itself is fabulous and very quiet and private. For those of you who are disabled, the villa is very wheelchair-friendly, with the master bathroom having more than enough space to accommodate a wheelchair user. The location is superb - a very short distance away from a supermarket and restaurants, and most importantly the Interstate 4, which is one of the main arterial routes through Florida. The swimming pool and lanai area is easily accessed and makes for a relaxing day. All of the Disney parks are less than 15 mins away, and shopping malls and outlets roughly 25 - 30 mins away. 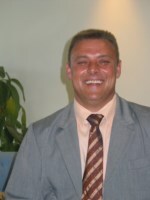 The owner is a true gentleman and looks after all of his guests very well. The management company are first class and are just on the other end of the phone any time of the day or night. I highly recommend this villa to anyone looking to book a fly - drive / self catering holiday. You will not be disappointed. Owner's response: Hi Louise, it was our pleasure to have you stay in our villa and of course accommodate one of your family members who used a wheelchair. It's also great to have guest's like yourself who make time to give reviews as it means a lot to me. I look forward to having you stay with us again.. Your enquiry will be sent to villa ref 1423 only. This page has been viewed 68394 times since 12 Aug 2004.